“Humming With Life”, the title of this mural is an understatement. The Post Office building at the corner of Hyde and Golden Gate is a magnet for drug dealers, crack addicts and homeless folks looking for a spot to lie down. 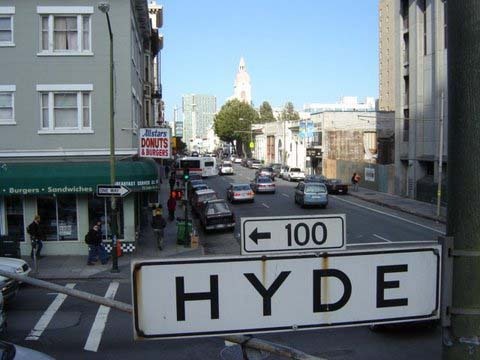 The Tenderloin has long been the neighborhood that offers services to the down and out so this is where they live with the vibrant mix of cultures and community in the North of Market of downtown San Francisco. The Civic Center Post Office does not sell stamps or send mail. It has endless rows of post office boxes for people without permanent addresses. 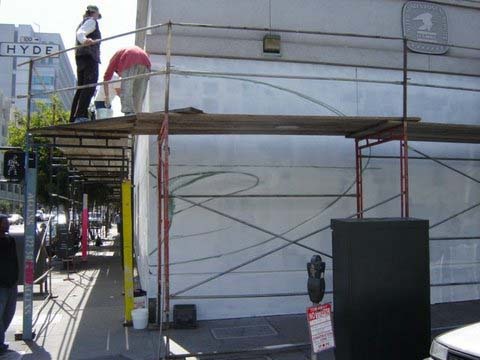 Occupation of public space is not for everyone but for those of us that like to paint big public architectural shapes, are interested in community, social practices and live street theater street it’s a compelling form of art. In the competition for the real estate of public consciousness between corporate advertising and non-commercial cultural expression murals have led the way. Corner sites are excellent. I was interested in creating movement around the corner, opening it up rather than bringing it to a point. The composition is a layering of a musical score, a garden of cultural architectural motifs and hummingbirds that fly in large to intimate scale through out the design. A light-hearted greeting to a heavy-hearted site. The humming bird’s heart is half of its weight. It brings delight, energy and hope when it appears. “The composition is a layering of a musical score, a garden of cultural architectural motifs and hummingbirds that fly in large to intimate scale through out the design. A light-hearted greeting to a heavy-hearted site. The humming bird’s heart is half of its weight. It brings delight, energy and hope when it appears.” – Such an amazing description of the vision…beautiful. I can’t wait to see when it’s done!! Enter your email address to subscribe to Johanna's blog and receive notifications of new posts by email.